Since the concept of universal design is already extending the boundary of disabilities, it is significant to include different aspects of information technology where universal design enabled efforts can contribute towards better designed systems, products and services. Sustainability is an important and growing public concern in today’s world. Nevertheless, attempts of designing IT system that can be called sustainable in nature are not so evident at present. In this paper we propose a framework originating from sustainable IT system design principles (also described in the paper). The universal design principles are used as a foundation upon which the resultant sustainable IT system design principles were derived. The concept of ‘sustainable IT system’ addressed in this research paper is beyond the common phenomenon of sustainability like green IT, CO2 emission etc. 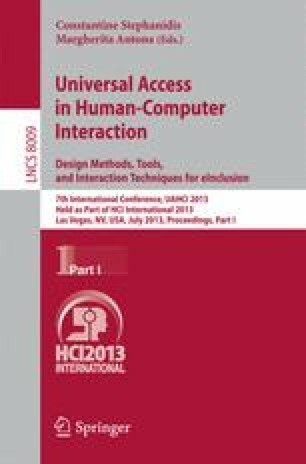 Rather, the framework proposed in this paper incorporates more user inclusion and increased user satisfaction together towards higher usability. And an IT system designed in this manner is a sustainable IT system according to the argument of this paper which can therefore be designed by following the proposed design principles and framework.